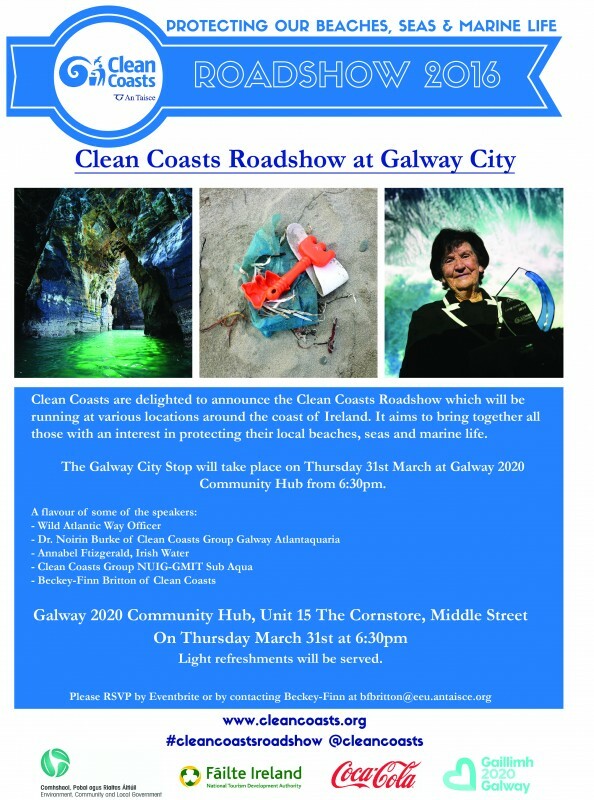 We would like to invite you to attend the Clean Coasts Roadshow in Galway City which will take place on 31st March at Galway 2020 Community Hub from 6:30pm (location: https://goo.gl/maps/JSGLXtNbDoC2). It is set to be a great evening of talks with a strong Think Before You Flush element. There will be a dedicated Think Before You Flush stand with infographics you can take home with you. Clean Coasts Officer Beckey-Finn Britton will be talking about the development of Ireland’s first Think Before You Flush community here in Ireland. Dr Noirin Burke from the first Think Before You Flush business in Galway will be talking about why Galway Atlantaquaria adopted the campaign. There will also be a talk from Annabel Fitzgerald from Irish Water who are supporting this great initiative. It is also the perfect opportunity to meet people who are also interested in protecting our beaches, seas and marine life.